Dr. Ian Kupkee teaches about how visible animal behavior offers clues to whether your pet is comfortable around others. If you live in Kendall, and you walk an exuberant, happy dog who wants to greet everyone, please allow me to introduce myself: I am That Guy. I am That Guy who ducks into the nearest side street, who keeps walking without acknowledging your dog’s obvious eagerness to play. I am That Guy who won’t allow my dog to have any fun, who can’t be bothered to stop and gush over your adorable goofball. Perhaps you think we are both anti-social. Perhaps I’ve hurt your feelings. But my dog is not an extrovert. He takes his walks very seriously, and when he’s on a leash, he’s on a mission. He’s also not able to easily dodge a boisterous, in-your-face dog which is why these types of dogs are frightening to him. He wants you to know it’s nothing personal. He wants you to know he’s a good boy. It would break his heart if he were pushed into doing something that might hurt you or your dog. In fact, he tells you this whenever he sees you - as does every dog in the world when they feel anxious or overwhelmed. Here are some of the ways in which dogs “tell” us they need their space, and would rather not be approached. If you look closely at my dog, and others like him, you’ll see that as your dog approaches, his tail goes between his legs. I know - your dog is harmless and just wants to say hi. But over-the-top friendliness can be very off-putting to an unfamiliar dog. And when dogs are bombarded with that kind of attention, the next step is often ducking behind the handler’s legs. In this situation, handlers lose control very quickly and are often unable to control what happens next. If the dog you are approaching raises one front paw and freezes, understand that this dog is frightened. Like a runner on the starting block, he is ready to bolt. When he realizes he cannot, he is likely to react. Please understand it is nothing personal, and respect this dog’s space. When dogs are anxious or stressed, they often display the whites of their eyes. 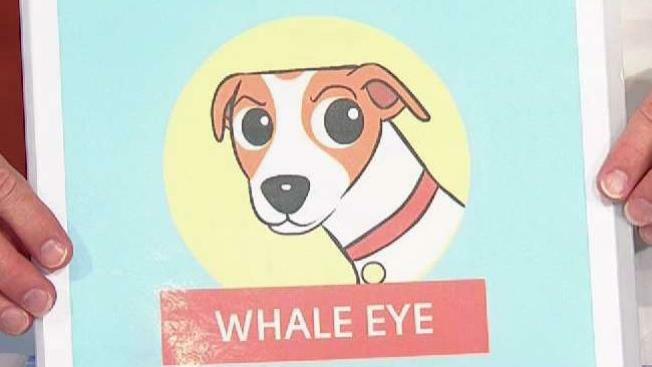 Known as “whale eyes” or “half moon eyes” in the animal care world, these are some of the most commonly observed signs of fear in our canine companions. A dog who is blinking or squinting excessively may also be trying to tell you your dog is overwhelming him. If a dog’s ears are flattened and sideways like airplane wings, he is not a happy camper. The same holds true for ears that are straight up and hyper-focused. It the ears are down and flattened, lending a worried expression to the face - the dog is worried! Set his mind at ease and keep walking. A dog who is dreading an unwanted encounter may display one of several avoidance behaviors. He may look around frantically or beg to be picked up. This dog is desperate to escape. More subtle avoidance behaviors involve looking away from the approaching dog or hunching down to make his body look as small as possible. This dog does not want to be your dog’s BFF. On the contrary, he wants to disappear. A forced meeting will not go well, and may even lead to a fight. Contrary to popular belief, dogs usually bite due to fear as opposed to aggression By knowing which dogs want to be approached and which do not, we can make dog walking fun for everyone in our community - even That Guy. Dr. Kupkee is the lead practitioner at Sabal Chase Animal Clinic. Click here for deals and discounts exclusively for NBC 6 viewers.